Regardless of anyone�s moral, political, or religious ideologies, there can be absolutely no denial that September 11th, 2001, was a day that shook the entire world. The tragic events that transpired on that Tuesday changed the world as we know it, and it will probably never be quite the same again. This excellent collection of eleven short films from directors all over the world is both moving and thought-provoking. Each movie runs for around ten minutes, and each offers a different perspective on the events that occurred, and the reactions of different people to them. The eleven short films are from the following locales: Egypt, Israel, Mexico, United Kingdom, USA, France, Egypt, Bosnia-Herzegovina, Iran, Japan, and Burkina Faso. Some have argued that this picture can be construed as Anti-American. I disagree wholeheartedly with this point of view. With the possible exception of the slightly soap-boxy piece about the treatment of Chile in the early seventies, none of the short films should really be viewed as either anti-American or pro-American. What each film does is present a new perspective on the tragedy, a perspective which perhaps would never have occurred to the viewer. How many �westerners� would have considered the reactions of Afghani refugees in Iran, who have never heard of a �tower�, and whose idea of an earth-shattering event is a pair of men falling down a well and dying? Or of children in Africa whose family cannot afford to buy prescription drugs for a dying mother? Indeed it would have been very easy for any of the directors to use the opportunity here to further any kind of political agenda, but the subject matter has been handled both tastefully and respectfully, while still having a strong impact and leaving the viewer perhaps a little bit wiser than before the film started. There are a few segments that stand out more than others. The piece from Mexico is particularly jarring, taking us back to that frightful day and rekindling the horror and emotion (for this reviewer at least), opening with a lengthy period of black accompanied by the chaotic sounds of horrified witnesses recounting the events as they occur. Intermittent flashes of images of the burning towers start to appear as the cacophony of voices reaches fever pitch, and a chill goes down the viewer�s spine as their memories of that day come flooding back. The French segment is equally brilliant, giving us the point of view of a deaf woman living a few blocks from the towers. Featuring almost no audio, other than the deep rumble simulating the vibrations she feels and that act as the closest thing she has to a sense of hearing, we watch her writing a letter to a loved one, completely unaware of what is happening so close by. This is not to say that the rest of the shorts aren�t fantastic, but to this reviewer the two listed (and perhaps a couple others, for example the incredibly moving piece from the USA telling the story of an old man who has lost his wife, living his remaining years believing to some extent that she is still with him) were the most notable. The video and audio of this disc are both outstanding, crisp and vibrant and of an extremely high quality. Unfortunately, however, the only extra feature is a trailer. It would have been nice to see some interviews with some or all the different directors, perhaps explaining the thought-processes that went into their treatment of the subject. 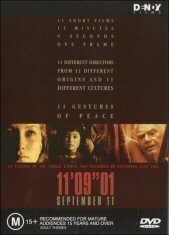 11�09�01 SEPTEMBER 11 is an utterly fantastic piece of work, and one which should be viewed by people from ALL cultures for the different points of view it offers of an event which almost everyone will have an opinion on. Please see this film.